On today’s episode I invited Maeve Ferris of Ebb and Flow Yoga Ireland to join me. I’ve been going to Maeve’s yoga classes since my Mum passed away last year. Not only has Maeve helped me release grief and build confidence in myself once again, she embodies moving from fear to trust. Maeve’s corporate background gave her the perfect skill set to leverage on for building her thriving yoga practice. As she shares, she only started teaching a class of 2-3 and in some cases 1 student but she was determined to give her students a great experience and as a result her practice has grown exponentially over the past 2 years. Maeve shares some serious fear moments she has faced along her path, including the very familiar “imposter syndrome” we can all secretly suffer when we’re on a steep learning curve. A key message Maeve shares with us is “You have to believe in yourself or it won’t work”. This to me is a lesson I’m learning time and time again. Once you’ve listened to the episode, I’d love to hear your thoughts in the comments below! P.S I’m opening the doors to Energy is Your Currency Membership today. Doors close this Friday 9th February at 11 pm GMT. This month we are following the Liver Rescue Cleanse by the Medical Medium. Click here to join. We all encounter negative people on our journey. One negative comment can derail you if you let it. 1) Choose to not feed them your energy. 2) Opposing them to get them to see your point of view. You strengthen what you oppose. When you do this you see that it’s a waste of your energy. 3) Accept what is. Come back to your own power. Take action to strengthen your boundaries. Eliminate people that are having a negative influence over your life. When you are going after your vision you inevitability encounter negative people that will try to bring you down. Having this awareness is really empowering so you can have the discernment to realise when you are falling into the trap. Richie and I have both learnt this the hard way dealing with people that are negative. These situations are opportunities for you to grow and evolve. We’d love to hear from you. How do you handle negative people in your life? Today Richie and I discuss learning to claim your value. Richie shares about his journey as a musician, starting off playing open mic gigs to pub gigs that sometimes he didn’t even get paid for. We discuss how surrounding yourself with the wrong people who don’t see your value can stop you in your tracks if you let it. Your intrinsic knowing that you are valuable spurs you on to create opportunities where you receive your value. You have to state what you’re worth and take action to show the world - this is what I’m about. Aisling shares her journey as a activist and doing her work for free. The transition to becoming a business owner has been full of lessons where the outside environment will mirror back to you your own beliefs and programmes. This is a practice with yourself to continuously see your value even when the outside world can’t see it yet. Your relationship to money is all to with your relationship to your power. Tell us what insights this episode brings up for you and your intentions for claiming your value in 2019? Want to go deeper with this practice? Doors are open until tomorrow 12th December to enrol in Energy is Your Currency Membership. This month’s theme is focused on getting ready to reach your next level in 2019. What we’ve been up to since September. Plant based holiday in Portugal: Richie feeling really energised. How my skin has improved from the Medical Medium Liver Rescue Cleanse. Talking your vision into reality. Aisling’s Retreat in Portugal Summer 2020. Call out your vision of what you want to do. Take the easiest first step to get this going. Recently met Dr Mary Helen Hensley best selling author of Bringing Life to Death at the Open Minds Conference Ireland in Waterford. Mary has inspired me to start writing my first book which I have just started. Hurrah. When you set out on your vision, the doubts and fears creep in. Can you really do this? Reframe your situation to empower yourself. Your perception creates your reality. Trust in the unfolding and go with how life is moving you. Embrace your next step. Surround yourself with people who will bring your vision to life. Over to you, what vision do you want to bring to life and what is the first easiest step you can take? Share in the comments below. Want to go deeper? I’m opening the doors to Energy is Your Currency Membership this Saturday 8th December. For the rest of December I am guiding you to prepare to take your life to the next level in 2019. Concentrate on where you are in your journey. Understand that everyone is at different stages in their journey - levels of skills, levels of networking, levels of support through your community and team. When you fall into the comparison trap (we all do with social media) by looking at others and thinking I should be doing XYZ. This feeds into doubt, insecurity and robs you off your creative power. Stay focused on developing yourself and mastering what is in front of you. Appreciate where you are now. Trust in the greater opportunities that are available to you in the right timing. Take inspired action and following through on what matters to you. Stay inspired by people you follow but always know that you are on your own unique journey and need to keep focused on mastering YOU. What is your biggest insight from today’s episode? What action can you put in place right away? Share in the comments below! Podcast intro music from Richie Ros's song Strange Mentality. 1) Accepting where you are with clarity and gratitude. This is a tricky one for high achievers as we always want to be further ahead than where we are now. We must understand that in order to get to the place where you want to get to, you have to accept where you are now. You must master the level you are on before you can reach the next level. Life is similiar to a computer game like Super Mario (remember him and his cool gold coins?). In order to reach the next level in your life you have to learn and master your lessons through practice and failure. "Master the moment" is a daily mantra that really helps to embed this understanding. 3) A daily practice that promotes a growth mindset is a morning routine and scheduling your top 3 priorities in your calendar. A 20 minute meditation in the morning to start the day and either night before or the morning schedule your top 3 priorities for the day. Focus your time, energy and commitment on getting your top 3 priorities done instead of trying to cram in everything and respond to all the urgent tasks that are never ending. You must access what is important so you can focus on the things that will move your life forward as opposed to spinning in all directions and not really getting the results that you want. Richie and I have committed to 30 days of daily meditation and scheduling top 3 priorities daily. We will report back next week on how this is going and what we learn from this challenge. We'd love to hear from you, what is your biggest insight from this week's episode? Share in the comments below. Today's episode is part 2 of the "Poor Me" trap series. We discuss the different ways that the poor me trap can show up in your life, for example "I should be further ahead in my life". You can easily fall into this trap when you don't connect to your higher vision. The poor me trap drains your energy and creates a self fulfilling prophecy that you keep feeding and others in your life buy into the story you keep on repeat. The poor me trap can show up in health, relationships, business/career and life purpose. It can show up in procrastinating behaviours around the things that will help you. What can you do when you are stuck in your "Poor Me" trap? Number 1 is to recognise your "poor me" trap either coming from yourself or from others in your life. Number 2 is to take action to change this story and write a new empowering script. Starting where you are, write down how far you have come since you were 10 years of age, all the many milestones and achievements to date. Fully realise how far you have come. Celebrate yourself. Now write down all the great things in your life that uplift you, the people, job, opportunities. Whatever is great right now, write it down and take it in. Use your past as inspiration to create your future vision in the present moment. Create a new script of an empowered life where you live your full expression. Your attitude shapes your life and the choice is yours. Over to you, what action are you going to take to write your new script? Let us know in the comments below! On today's episode we discuss part One of the "Poor Me Trap" Series. Richie shares his story of growing up in childcare from the age of 4 - 14 years old. The poor me trap is your victim story that can keep you trapped in your past experience or current challenges you are navigating. How can you identify your poor me trap? Your story from traumatic past experiences or current challenges that keep you stuck from living the life you want to lead. Richie always thought he didn't have a chance. His poor me trap made him feel that his future was going to be a disaster. How did Richie turn this around? Richie shares with us how he overcame his poor me trap and the glimpse of light that changed the course of his life. Richie shares how you must go with how life is unfolding. There is a certain destiny to your life but you can do specific things to change the course of your life. The power is in your hands. Richie calls Aisling out on the poor me trap she keep falling into since Martha passed away in May. Aisling shares exactly what the poor me trap looks like for her and what she does to turn it around. Can you identify your poor me trap? We would love to hear from you what does your poor me trap look and feel like and what action step can you do to turn this around? 1. The reality of surrounding yourself with negative people that can take away your focus. 2. When you are on an evolutionary journey you need support to navigate the changes you are going through. 3. Discovering your unique expression. 4. Tools to clear your old reality, dissolving those old beliefs to allow your true essence to be expressed. 5. Honouring your process and staying committed to your growth. 6. Keeping your energy open and expansive so you can keep focusing on what you want to achieve. 7. If you have a goal you want to pursue surround yourself with people who will encourage you as you navigate the uncertainty of the unknown. 8. You have something unique to offer the world. Don't be afraid to get out there and shine your bright white light. You are welcome to join Energy is Your Currency Membership. My online group coaching programme that is designed to support you as you emerge into your fullest expression. Sign up at this link. Today's episodes discusses how your beliefs create your reality. Your beliefs tell you how to direct your life which in turn creates your reality. Your beliefs come from the feedback input you get from your environment. Sharing your visions with the wrong people can stop you in your tracks and plant seeds of doubt that prevent you from flourishing. The power of words and intentions on water, scientific experiments by Dr Masura Emoto. How negative input from others in your environment can shape yours beliefs of yourself. 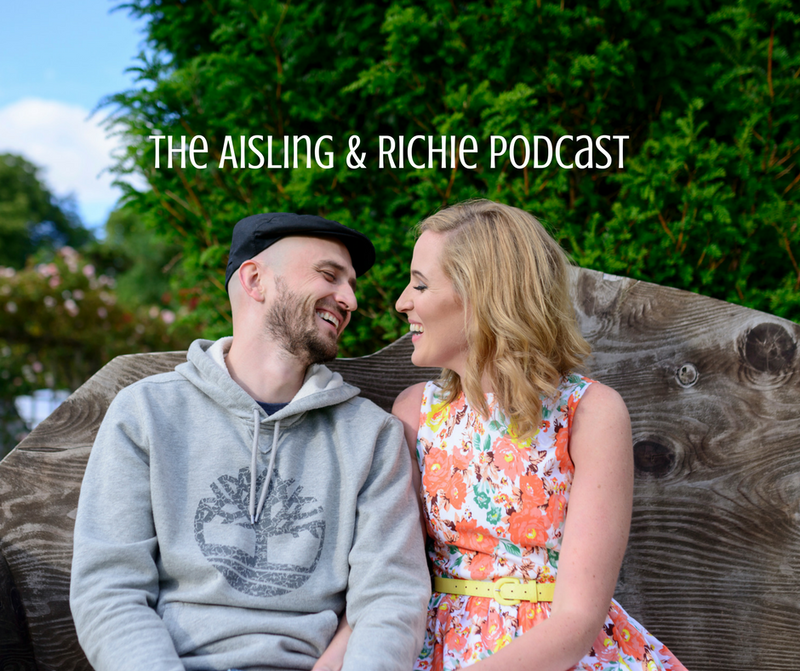 We are doing the Aisling and Richie Podcast to support others to reach their highest vision. You are welcome to join Energy is Your Currency Membership which is designed to help you grow and evolve into your highest visions. I provide body igniting nutrition, weekly focus, tools, techniques, energy healing, group coaching and a community of like minded/hearted people who are expressing their highest vision. In this episode Aisling and Richie discuss Aisling Mum's health challenge that has landed her in Intensive care the past 7 weeks. Aisling talks about what the health challenge is and steps she is taking to be empowered in this journey of navigating her biggest fear. Aisling is very determined to continue doing the work that her Mum has helped her with over the years and continue on building the foundation that has taken 7 years to create. If you would like support with your health journey, there are spaces available in Aisling's 1:1 Holistic Nutrition Coaching Programme. To find out if this is the right fit apply for a Clarity Call. Change is a journey that requires support, tools and techniques to maintain long term. Will power only last so long, what determines sustainable success is having the space to introduce small steps that lead to profound change. You are literally rewiring your neural pathways and nervous system to accept what is outside of your comfort zone. In this week's episode we decided to share with you all our own personal journeys that has led us to where we are today! "I Hope I Screw This Up"
In this weeks episode we discuss a book that I'm currently reading called "I Hope I Screw This Up" by Kyle Cease. It's a real eye opening book that I would highly recommend reading. We discuss how we have struggled with recording this latest episode 2 of our podcast show. Taking the first steps with anything you do in life are always the hardest. This is because you are entering into the unknown. This will bring up a lot of fears and uncertainty as well as doubt and excuses as to why you shouldn't do it. In this episode we discuss why you should feel that fear and just do it anyway. 6.How to take the first steps and Stop procrastinating.